This turned out to be a busy holiday weekend. Big surprise. Between holiday travel, an impromptu work day and a practically impromptu dinner party, I was starting to think this would have to wait. 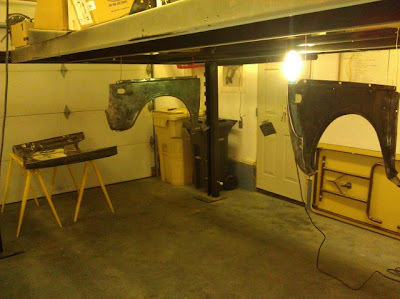 Luckily, I got into the garage this morning and finished media blasting the few remaining parts that would be needing body color. I cleaned and hung everything I could from the lift. 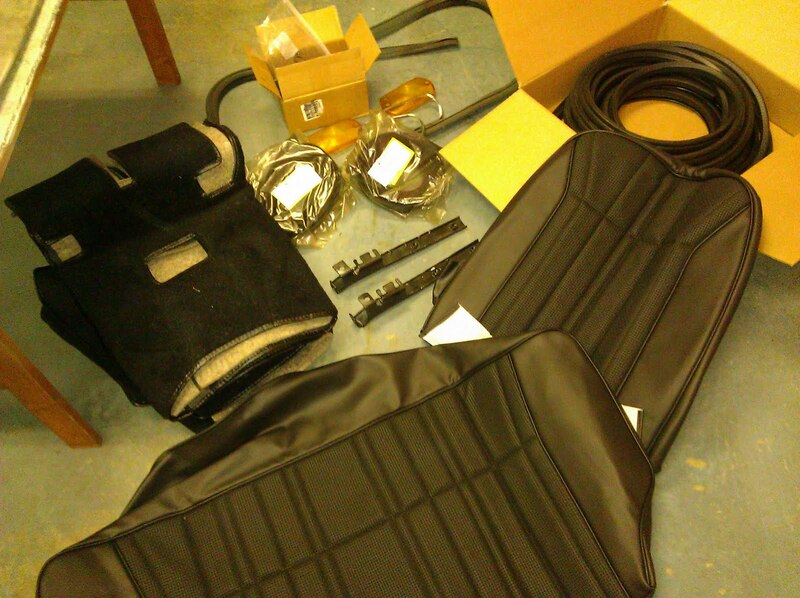 I suited up, and shot everything with an etching primer to prep the bare metal for priming. I then gunned the catalyzed primer and single stage body color on the back sides of the fenders, under side of the hood, and insides of the doors. 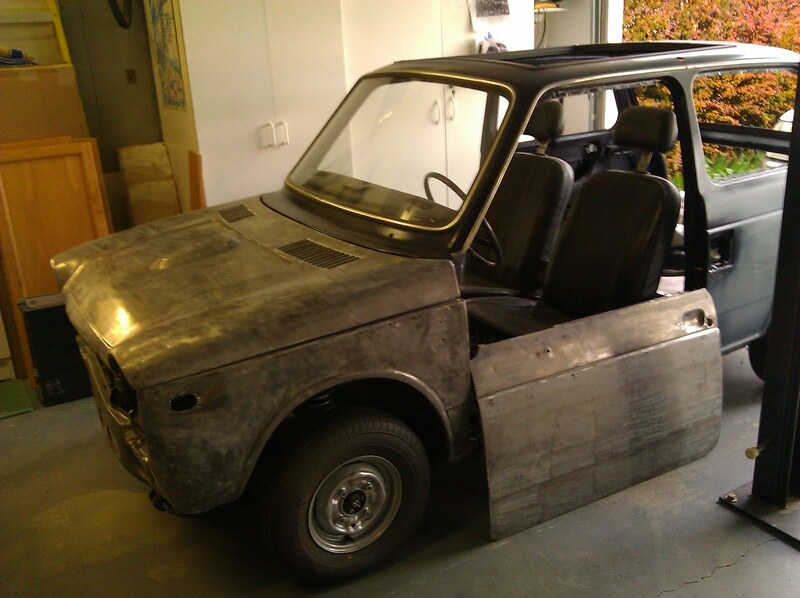 The Hood and door hinges, the fuel door and rear bumper panel needed to be painted prior to reassembly also, so they got the same treatment. I was conflicted about how to ventilate the garage while spraying, as I had been running two heaters all day to get up to the recommended 70 degrees. I was a little alarmed to come inside and remove my respirator and smell automotive paint. I set up the spray booth fan set up I used earlier in the project, and opened several windows in the house to clear the air. It smells fine now, but I think I will run the fans overnight to aid in drying. Life has finally slowed down enough to allow me to get back into the garage, and back onto Matilda! It has taken me a bit to get my head back into the project, but I think I have a plan of attack. I've spent the last few weekends sand blasting small parts, and this weekend, I broke out the wire wheel. So now I have the Hood, fenders, one door, various hinges and the rear bumper panel ready for jamb-painting. I had been planning to do the final paint, as well as all of the ensuing body work, myself. Fortunately, I came to the realization a few weeks ago that that would only serve to frustrate me, and drag this project out even longer. So I have decided to find a good body and paint man to do the finish work. I fully plan to have this baby on the road next summer, so that should help. 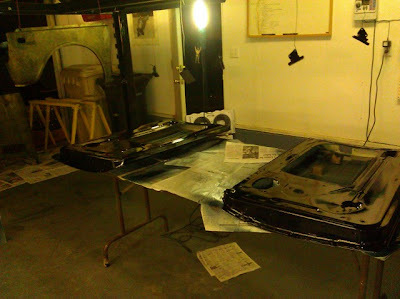 As near as I can figure, I have the passenger door to strip, and I should be ready to start the painting process all over again. It's so nice to be making real progress again! I call it that since I am technically merging three cars into one, but this post is more about acquisitions. Our summer was insanely busy, as usual, and so progress on Matilda took a back seat (also as usual). We were both in a play, got a new puppy, worked on remodeling the kitchen, and well, it was summer. I decided that since I wasn't going have much time to spend on the car, it might be a good use of time to pick up some of the items I would eventually be needing. I'm not sure why it took me over four years to realize that the more time I waste, the less available many of these parts may become. I sometimes wonder how my brain works. So, with this revelation came action. I started contacting N-600 guys, and keeping an eye on eBay listings. Now that I have the windshield installed, I would be needing the gasket for the back window. And as long as we're talking windows, I'm gonna need weatherstripping for the pop-out side windows and the doors. Bill Colford, a great resource for parts and knowledge, had part numbers for the weatherstripping, and has a guy that manufactures the windshield gaskets. As luck would have it, Bill also has an upholsterer who makes beautiful reproduction seat vinyl. And since we're getting new seats, a new carpet kit is a must. The carpet is offered by Mike O'Connor, who built our engine. Last week I sent the door handles and trunk lock to Miles Chappell, another great resource, to have them re-keyed and polished. As always, eBay has also been a good source of various items. I got a pretty nice set of front turn signal lenses with housings from someone in California, and rear bumper brackets from Ray Cave in Missouri. I did get into an exciting bidding war over a very nice pair of tail light lenses. These are extremely rare since they were never really great quality to begin with, and after 40 years of weather exposure most of them are shot. It got up around $350 at the end of the auction, when some guy swung in in the last few seconds, and stole them. Fortunately, another guy got them from him a second later. Bloodsuckers. That prompted me to search for a way to make molds that would allow me to make new lenses on my own. I found a kit that might just work, but it will be so long until I'm ready to reinstall the tail lights, that I may come across another set somewhere. 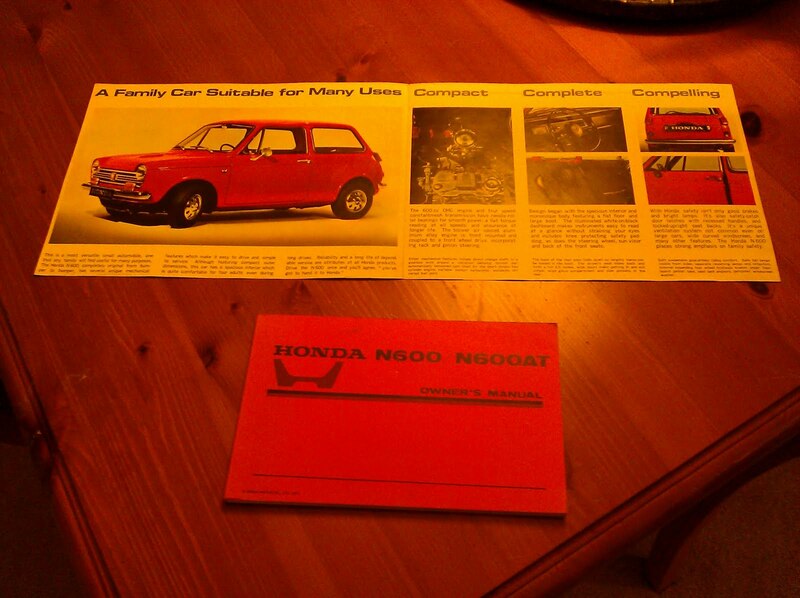 I was pleasantly surprised by a gift from a fellow restorer, when my buddy John gave me an original N-600 brochure! It is in pristine condition and will have a prominent place in my garage when I have time to have it framed. His gift made me realize this would be a good time to pick up an original owner's manual. Both were located in Great Britain for some reason. It's always in the last place you look.